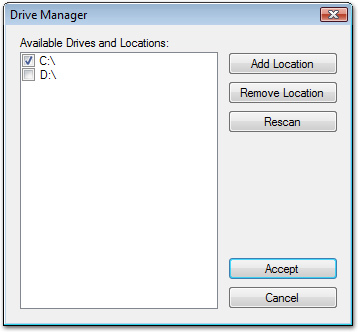 Drive Manager dialog lets you select which drives, folders, and network locations to display in the Folder Tree View of SizeMeNow. Add Location: Displays the dialog which allows you to add a local or a network folder to the list. Remove Location: Removes the currenty selected locations from the list. Rescan: Rescans the computer to determine all local drives available. Note that the entire list will be replaced by the default set of drives.